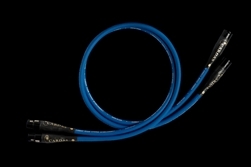 Clear Cygnus Interconnect features the finest Cardas Copper in Matched Propagation Conductors, arranged in a star-quad geometry. A re-design & improvement over Clear Light Interconnect, Cygnus offers the traditional Cardas warmth & musicality along with the accuracy & spectacular imaging for which the Clear line is known. Clear Cygnus Interconnect works well at any length. .375" O.D., Cardas copper, PFA-air dielectric, 4 x 25.5 AWG Clear Light conductors, Matched Propagation, Golden section, Crossfield, litz, double shielding, Alcryn jacket. Clear Cygnus Interconnect is terminated with Cardas GRMO RCA connectors or Neutrik XLR plugs. Cardas CG-XLR plugs are available as an upgrade.